Can you guess what we made this weekend? Ella spent a lot of time and had great fun mashing bananas! 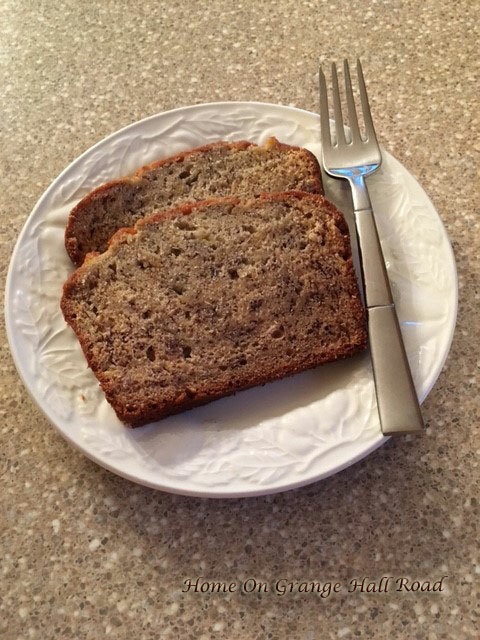 Yes, we made banana bread!! Here is Ella ready to put the bread in the oven. And here is the finished product! It was delicious! Nora really liked it as did Ella and I. Grandpa Murray said it was ok! What? I don’t think he is a fan of banana bread. We followed the Gold Medal Flour recipe. In my opinion, you simply cannot go wrong with Gold Medal Flour! Move oven rack to low position so that tops of pan(s) will be in the center of the oven. Heat oven to 350°F. Grease bottoms only of 2 loaf pans, 8½x4½x2½, or 1 loaf pan, 9x5x3 inches. Mix sugar and butter in large bowl. 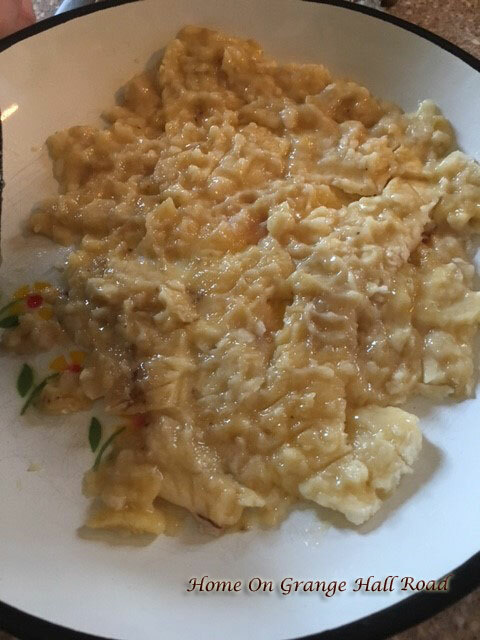 Stir in eggs until well blended. Add bananas, buttermilk and vanilla. Beat until smooth. Stir in flour, baking soda and salt just until moistened. Pour into pan(s). Bake 8-inch loaves about 1 hour, 9-inch loaf about 1¼ hours, or until toothpick inserted in center comes out clean. Cool 10 minutes. Loosen sides of loaves from pan(s); remove from pan(s) and place top side on wire rack. Cool completely, about 2 hours, before slicing. Wrap tightly and store at room temperature up to 4 days, or refrigerated up to 10 days. 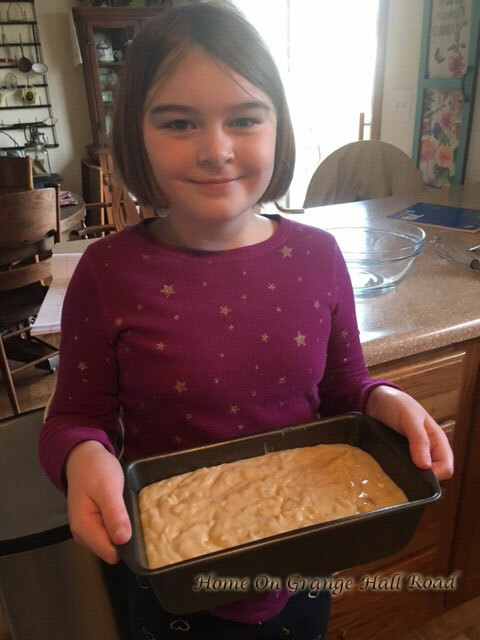 This is a really easy, simple recipe that give aspiring young bakers like Ella valuable experience in the kitchen. Next time around, we will be doing a big cookie extravaganza for our annual cookie bake sale at church. On another note, I celebrated my birthday this past weekend with my precious family. We had a delightful meal that included birthday cake, cupcakes, and banana bread!! I received some beautiful handmade with love cards from my grandkids, lots of birthday wishes from my friends on Facebook, new garden gloves and pruners (I can’t wait to use them so hurry up Spring) and some wine! It was perfect!! !